The first time I watched Willy Wonka and The Chocolate Factory as a child I could feel the excitement as Charlie unwrapped his golden ticket–followed by feelings of terror thanks to a certain boat ride in the movie. I still get a tinge of that same rush when I unwrap a Défoncé Chocolatier Vanilla Chocolate Bar. It feels like an exclusive ticket to a classy cannabis world I never knew existed. The brand’s elegant packaging, unusual design, and gourmet taste create an upscale edible experience until the last bite. The lack of hellish imagery while surrounded by Oompa Loompas is also a plus. Expectations are high, especially since I’ve grown to become an edibles snob. I’ve eaten more infused chocolate bars than I can count but this white one radiates high fashion like Nicole Kidman on the red carpet. So I have a reason to head to The Grove for a hearty outdoor lunch with the infused vanilla bar as dessert before hitting the shops. I’m ready to feel en vogue. I’m also ready to stop imagining that Défoncé is Beyoncé’s long lost sister. Is this fancy vanilla and white chocolate bar as palatable and potent as it is pretty? Let’s find out as we rip it open like E!’s snide red carpet panel in this extensive review. The Défoncé vanilla bar comes in a black, child-resistant zip bag. Inside, the classy but minimally designed box includes the company’s gold-foiled logo (reminiscent of the Coach logo), dosage and a brief product description. In bright relief along the bottom band of the box is a pastel orange strip covered in a retro pattern that immediately speaks to me. Lift the flap to reveal nutrition facts, ingredients, warnings, manufacture and best by dates, lot number and a dosage diagram. There are three different doses: 90mg on the bag, 86.9mg on the testing sticker, and 180mg on the box. I presume the sticker is accurate, though this inconsistency could be problematic if you’re worried about getting a precise dose, even with the diagram. I’d also like to know what strain was used. 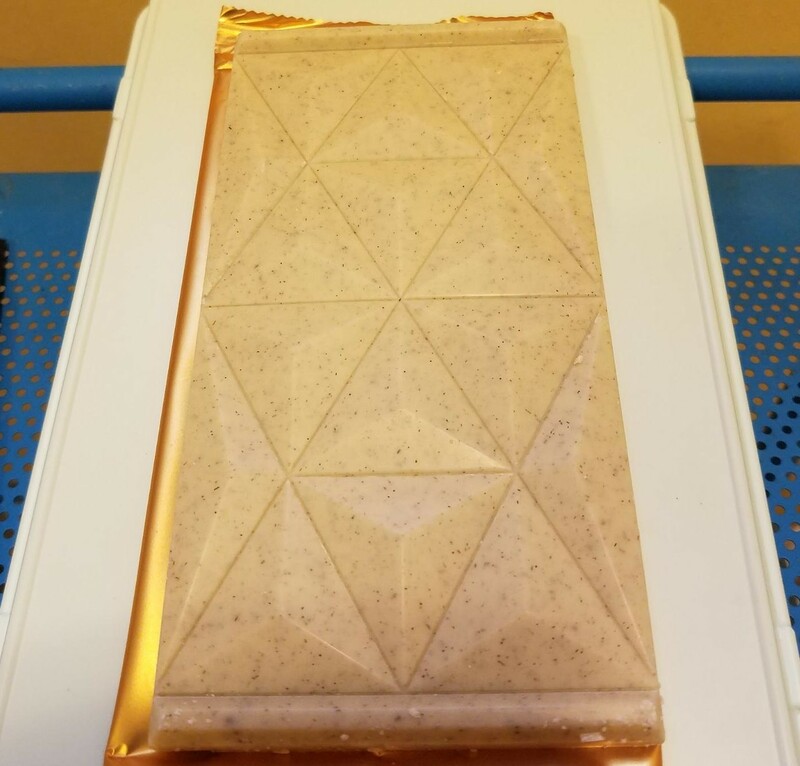 After unwrapping the gold foil, the chocolate bar itself looks unlike anything I’ve seen: peppered white chocolate with a symmetrical triangular pattern that appears cut from marble. This meticulous attention shows just how far Défoncé Chocolatier goes to create a memorable edible experience. I notice some people around me eyeing the gold foil and light grey color, but have no idea it’s infused. After rubbing my hands together like Mr. Burns and whispering “excellent” to myself, it’s time to shop! Défoncé uses single origin, sun-grown cannabis that’s sustainably farmed in the Sierra Nevada foothills. Like winemakers and coffee growers, using cannabis from a single source with its own microenvironment and biome, or terroir, uniquely enriches the flavor and terpene profile. It’s then infused with a solvent-free, CO2-extract that helps preserve the terps to produce a clear, clean and tasty extract. The bar itself is made from simple, quality ingredients: 31% white chocolate, vanilla bean, and cannabis extract. It has a balanced richness that isn’t too sweet so I can taste the subtle complexity cannabis just below the surface. I’d eat it this even if it didn’t contain cannabis – you can crumble the irregular pieces on top of ice cream or melt it down into a fruit dip! While the bar’s geometric pattern is distinct, the smaller, unusually shaped pieces are difficult to break into clean, accurate doses. Using a knife is a small and worthwhile sacrifice before indulging in this highly crafted edible. About an hour after lunch, I felt a change in perspective as I became more mindful of my surroundings. I noticed birds chirping and people chatting while passing the Coach store and examining the chic bags, dresses and accessories along the way, which helps melt my anxiety and stress–especially if I buy something. I remained productive and clear-headed through the evening without the heavy sedative effects I sometimes feel with edibles. When I got home, I wasn’t as sleepy as expected from walking all day. I’d eat this Défoncé Chocolatier Vanilla bar again before a concert, workout or any creative activity like cooking, painting or writing. This quality chocolate, distinct design and about 90mg THC for $20 makes me feel like a fashionista. Pardon me while I put on a black sun hat, oversized sunglasses, and fire everyone in my factory. Beautifully packaged with a generic child-resistant zip-bag. Large branded sticker on both sides; proper protection. Vanilla chocolate bar itself features a unique triangular design. Enough information for compliance, but the dosage label is contradictory in three places. I’d like to have seen something about their business practices and type of extraction. 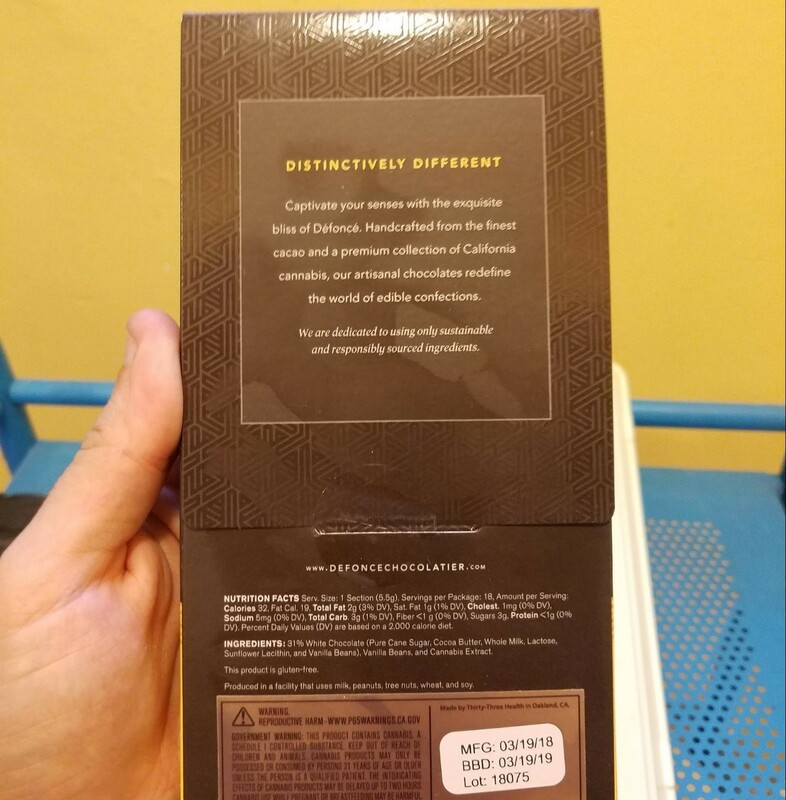 Dosage chart supplied on the package; chocolate bar has markings to help you with accuracy. Because the THC content is contradictory be extra careful; trust the lab results and dose accordingly. A bit too much chocolate to consume all at once for someone like me who prefers to ingest the entire 90mg bar. Can conceal any mention of cannabis right out of the wrapper. 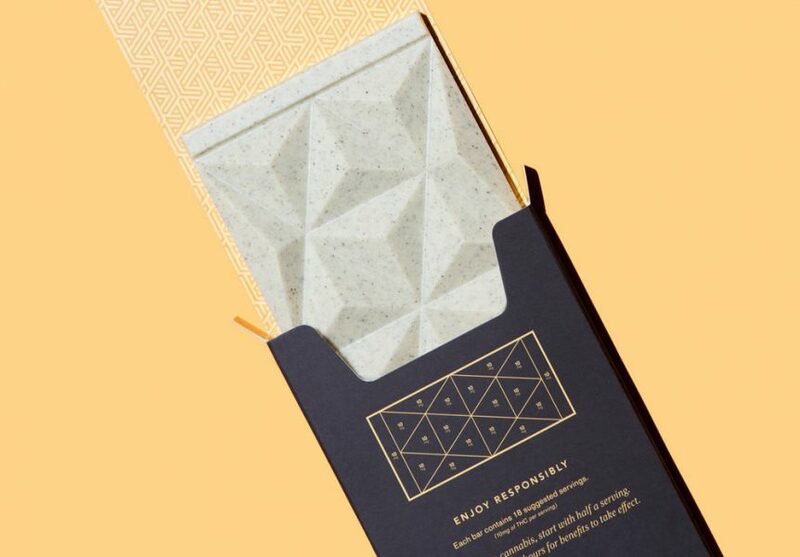 In the box or on its own, this edible looks like any high-end chocolate bar. But the box and bar are so large it’s hard to conceal you’re munching on something. High-quality chocolate that’s rich blend of white chocolate and vanilla. I would happily eat this again even if it didn’t contain cannabis. Triangular pieces aren’t completely flat or smooth but protrude slightly. Melted in my mouth just as smooth chocolate should. Visible vanilla bean particles weren’t noticeable in my mouth. Unless it’s a hot day or you’re holding this bar for too long, it won’t leave any residue on your fingers. An hour after consuming, I started to feel these clean and lucid effects arise. Left me feeling productive and clear-headed without being overly sedative. Ideal for activities like shopping, seeing a concert or working on something creative. Could incorporate this pure white chocolate with vanilla bean in numerous recipes. Think outside the box! Melt then cover fruit (strawberries, raisins, bananas) or make a fancy frosting. Crumble over frozen yogurt, ice cream or granola mix. Use as “chips” for fresh-baked cookies. Same high-quality ingredients, design and flavor are always consistent. Cannabinoid content fluctuates a bit per bar. Priced a $20, this is a pretty good deal for a chocolate bar that looks and tastes like it could sell for the same price without cannabis in a high-end supermarket. The white chocolate in this Défoncé Chocolatier vanilla bar is a nice change from the usual milk and dark chocolate offerings. You feel the effort that goes into their branding, packaging, design, ingredients and extraction from unwrapping to eating. This edible’s effects were cerebral, euphoric, relaxing and creatively energizing that made trying on clothes and piecing together outfits more fun. For $20, I put this stylish edible at the top of my list when I want a lucid and creative high without sacrificing my productivity. I just wish I got a similar deal this afternoon (handbags are expensive). Are you ready to give this Défoncé Chocolatier Vanilla Chocolate Bar a try? Visit the Nugg Marketplace and see what dispensaries deliver in your area. If you’re looking for a different product, chat online with Nugg’s Cannabis Concierge. Our team of experts will listen to your needs and help you find exactly what you’re looking for.